The brand new mobile game "Kingdom of Trios" has just dropped! The Fun Filled Lucha Super Show is ready to take over your mobile device! 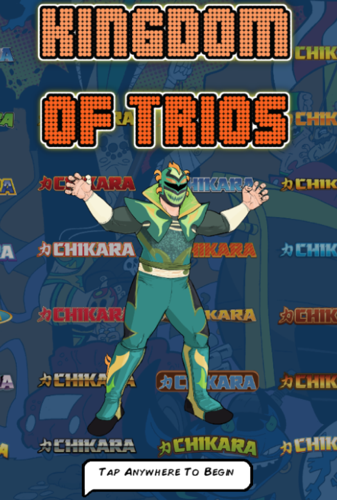 This Match-3 puzzle brawler allows you to take control of your favorite CHIKARA stars and level up across 3 awesome game modes. Play in "Season" mode to manage your own stable to championship gold, "Best Of" mode to test your might across an ever increasingly difficult challenge, and "Vs" mode to earn XP and rewards in singles, tag team, and trios action. There are 18 characters to choose from, with more on the way! Download for FREE in the App Store or on Google Play! Benefiting the Arch Street Center!